"There's no better way of storytelling than teaching through the use of fantasy and puppetry. The work done by the Center of Puppetry Arts is critical for our community since storytelling is essential for children's development. The Center of Puppetry arts not only helps disseminate knowledge but helps our children become more intimate with their cultural heritage". 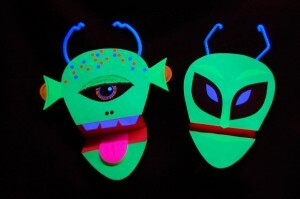 This January join the Center for Puppetry Arts for an intergalactic journey of discovery. Space! takes the audience on a fun-filled rock-n-roll exploration of the cosmos. Written and Directed by Jon Ludwig and music composed by John Cerreta this 2011-2012 family series runs from January 26 through March 11 at the main stage theater. In space, no one can hear you... learn! Blast off on a galactic journey of scientific facts and pure fantasy with your hosts, Ot and Eema! Discover out-of-this-world facts about planets, stars, meteors and more! Feel the gravitational pull with Sir Isaac Newton, gaze at Saturn's rings with Galileo, rock out on the asteroid belt, and cheer on the moon landing of 1969. Ever wonder what kind of gas fuels the sun, or where the planets got their name? Find out in this galactic trip filled with cosmic special effects, non-stop action, and an eclectic musical score fit for a universe as vast and diverse as our own. Blending rod, shadow and blacklight puppetry with projections, this show offers a unique take on science for families, schools and other groups. Kids can bop along to 15 original songs, gaze with awe at hundreds of NASA images and get silly with a host of unusual characters. On Saturday and Sunday, Jan. 28 & 29, the Center invites patrons to take part in our S.T.E.M. activities to learn more about the science, technology, engineering, and math of puppetry. Families can visit different stations throughout our museum exhibits, and after completing all the activities, children can become S.T.E.M. Stars on our Galllactic Bulletin Board! Particpation in these activities are free with the purchase of a SPACE! ticket. Activities are appropriate for children in grades K – 6. Ideal for 3rd and 4th graders. · Tuesday to Friday: 10:00 a.m. and 11:30 a.m. Single show tickets include admission to the Museum Exhibits as well as the Create-A-Puppet Workshop, where kids can make their own Extraterrestrial Hand Puppet. Tickets are available for $9.25 (members) and $16.50 (nonmembers) and can be purchased online at www.puppet.org or by calling the ticket sales office at 404-873-3391.